A youngster will get some keen thrills out of driving his own specially designed midget motorbike along the highways at a clip of 40 m.p.h. Read this article to learn how to build one of these miniature jobs or cut down a big machine to make it suitable for a 10-year-old boy. AN EXCEPTIONAL opportunity for the mechanically-minded person to exercise his ingenuity and creative ability is afforded in the construction of miniature motorcycles for youngsters ranging all the way from three up to eight or ten years of age. When complete, these tiny motorcycles operate exactly like their larger brothers, which may be seen in the hands of sportsmen and motorcycle policemen. The tiny engines propel the little machines along at 35 or 40 miles an hour, yet are easily controlled at a twist of the wrist by regular motorcycle throttle and spark grip. Needless to say, the youngster who is in possession of one of these custom built motorbikes is the envy of all his friends, and his grownups may feel that they are performing an educational service for the youngster in teaching him so early in life to control powerful forces. If desired, a regular three-speed gearbox may be fitted, so that the young rider may learn to shift gears, as well as control engine speed in learning to drive the machine. A system of electric lights, electric horn, and other accessories, are adaptable to these tiny machines by the use of bicycle parts. 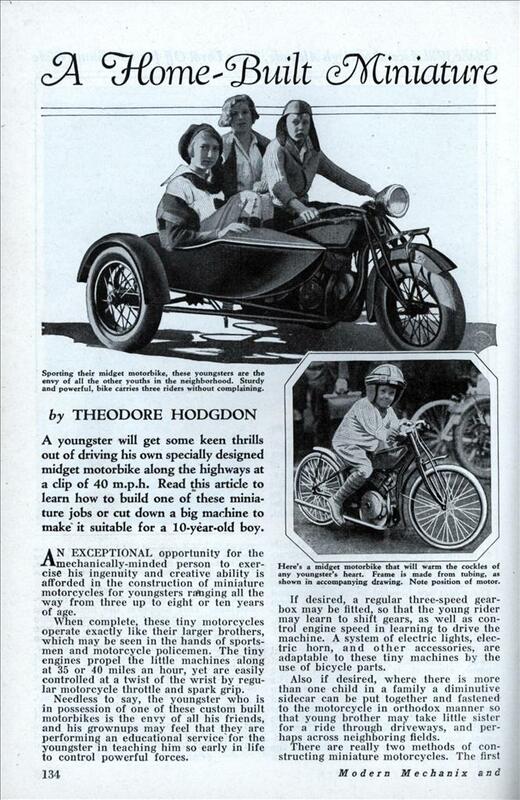 Also if desired, where there is more than one child in a family a diminutive sidecar can be put together and fastened to the motorcycle in orthodox manner so that young brother may take little sister for a ride through driveways, and perhaps across neighboring fields. 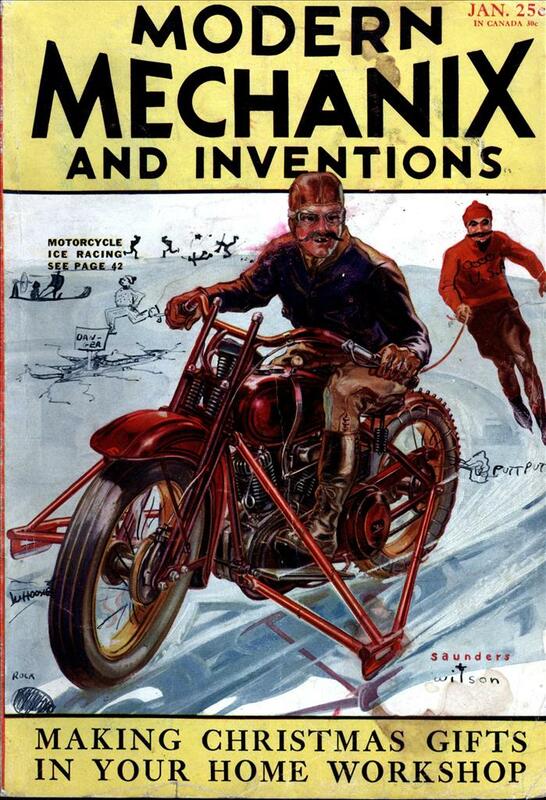 There are really two methods of constructing miniature motorcycles. The first is to design the small machine from start to finish, using pneumatic tricycle or bicycle wheels up to 15 or 16″ in diameter, constructing the frame of steel tubing, flattened at the ends and bolted together, and using a small one cylinder outboard motor engine, or perhaps an old washing machine engine or even a lawnmower motor, provided it is small enough. These very small machines will weigh only 35 or 40 lbs. when complete, and therefore not very much power is required to propel them along at a brisk clip. Three speed gears are not really necessary on so small a machine, but almost any motocycle dealer will have on hand a small three-speed gearbox which may have been taken from some ancient lightweight motorcycle. Usually these gearboxes are not too heavy, and they may be neatly installed in the frame, as shown in the drawing on this page. “Grown-up” Bike Cut Down to Midget Size The second method of building a miniature two-wheeler is that of taking the ordinary sized motorcycle and cutting it down to ten-year-old boy’s size as shown in accompanying illustrations. In performing such an operation on the large machine, it is best to start with a motorcycle that is not too large, such as a 37 cu. in. twin, or perhaps a 21 cu. in. single. The builder should then secure a large sheet of paper (brown manila wrapping paper will do). Pin it on the floor or wall, and lay out the new design for the frame, full or half scale, figuring on taking out sections here and there so that the engine when put back into the frame will clear the ground by only two or three inches, and the frame itself will hug the top of the engine very closely. Sections Sawed Out of Bike Frame The shortening of many of the frame tubes is necessary, and this is easily accomplished by sawing out sections and putting them back together with reenforcements inserted as shown in the sketches. The front forks and the rear fork tubes also must be shortened to accommodate the pair of small wheels, preferably airplane wheels, of about the size used on the tail skid of the great trimotor Ford airplane. These wheels complete with tires may be secured as small as 12″ in diameter, although it will be far more economical to use regular airplane wheels and tires, which may be purchased second-hand in sizes as small as 15 or 16″x-3-1/2″ or 4″ (tire size). The mudguards must also be cut down and by careful heating and occasionally splitting with a hacksaw they may be bent to perform with the size of airplane wheels which you employ. A little ingenuity will solve the problem. The installation of the front wheel offers no particular difficulty but the rear wheel, before it is installed in the fork, must be fitted with a sprocket on one side and a brake drum on the other. This may be accomplished by a simple brazing operation. It is not necessary to go into an expensive machining operation in fitting the brake and sprocket to the rear wheel, because of the light weight and slow speed which the small motorcycle will achieve. The gasoline tank of a regular motorcycle may be cut down as shown in the sketches. The front portion of the tank is removed, and the rear portion forms a neat tank provided the front end is done well with pains and much careful shaping put into the job. Handlebars also must be shortened and perhaps a bicycle seat installed in place of the large motorcycle seat. Nearly all electrical equipment can be put back into the machine except perhaps the storage battery and generator, for which it is possible to substitute one or two dry cells in a bicycle lamp case. When complete the entire motorcycle may be carefully enameled with a two-tone color combination such as may be seen on the late sport model motorcycles put out by the great motorcycle factories. The construction of a tiny sidecar to fit a motorcycle of this type is a comparatively simple matter. The chassis is built up of tubing, either bolted or brazed together, depending upon the facilities available to the builder. A bolted chassis will do, provided no very high speeds are attempted with the tiny machine. The body itself is easily built up of a wooden frame, covered with sheet tin or aluminum and upholstered with padding and leather obtained from old automobile cushions. This tiny body may be hung upon small buggy seat springs or coil springs, such as may be found in almost any automobile spare parts depot. When ready for the road, the miniature motorcycle should start easily, either by pushing or by kick starter, and the carburetor control should be adjusted so that it will run at very slow speeds, in order that the youngster may become accustomed to it without fear of its power. In fact, it is advisable to set the adjusting stop screw on the top of the carburetor so that the throttle cannot be opened more than perhaps one-quarter or one-half of its full throttle, at least until the youngster becomes accustomed to the motorcycle. If carefully planned and painstakingly constructed, one of these miniature motorcycles can be a source of great pride both to its young owner and the man whose handwork it represents. A ten year old, a motorcycle, 40 mph. What could go wrong? I still have a scar on my knee from a neighbor’s brakeless minibike. MM readers may be interested in this home built, retro styled, motorized bicycle. His parents, figuring this wasn’t foolhardy enough, also gave their kid a biplane and a Thompson submachine gun. Wow, back when people weren’t afraid to go outside. I would love to do this for my kid – I should start now, though, because I have no skills whatsoever. Just think, back then, this was not even something that most people would have considered as difficult – to spend time building a small motorcycle out from scratch, for the pleasure and well-being of their kids. C’mon, people, isn’t it time we got back to doing stuff like this with our kids? Using our hands? Making stuff? Instead, we all just sit by the TV, mouths agape, and think “my goodness, but at least this activity is safe!” Let’s not think that actually doing something that might have a whiff of danger involved could be beneficial to a 10 year old. Judging by the comments so far, I must have lived out of time. I’m only 51 and in the 60’s and 70’s, my cousins, friends and myself had home made minibikes, and motorized bicycles (direct chain drive) with breaking only occuring when you hit the kill switch on the handle bar. I improved mine by using a belt drive and a pressure idler pully that I’d apply with my foot to go and let off to slow down. Of course this meant I had NO breaks. This was normal stuff, along with bb gun wars and homemade bows and arrows, walking out into the woods for weekend get aways (no adults and the oldest kid about 13). I didn’t know then that I was living in such a great time. Are you kidding me?! 40 MPH at 10 is nothin nowadayz! When I was 7..way back in 1970, my dad made a motor bike for me from an old 2 hp lawn mower and an old bvicycle. We rode it around a big dirt lot behind my house all summer when .25 filled the tank for the whole day! I am NOW…at 47 and I’m putting a 1955 1.8 hp Jaconson lawn mower engine on a 1947 JC Higgins and watch out kiddies…I will be passing you by as your parents keep their eyes on the road while driving thier BROOZER SUV while YOU stare at your DVD screens whatching cartoons from the back seat and then whip your neck around to see ME passing you by. Maybe mom and dad should make one for you too! You are never too old or yound to go out in the garage and make something cool with your own hands!